Owning a fine print is a special experience equal in many respects to owning the original . The Giclee (Pronounced zhee-clay) process accurately produces a look and feel reflective of the original painting. The Canvas Editions are produced in original size and replicate the character and texture of the original painting in remarkable fashion. 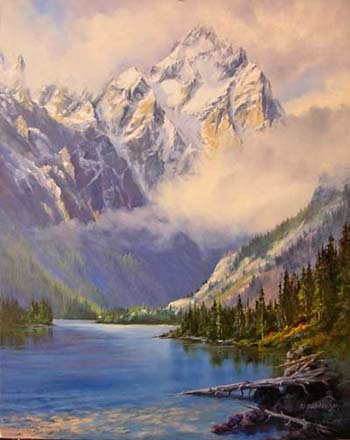 This painting depicts the majesty and serenity of the Grand Tetons. 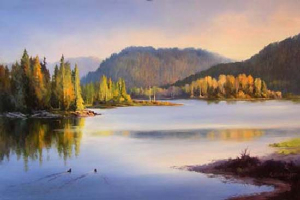 The original painting was developed from onsite pleinaire and photograqhic references of Mt Owen, Jenny Lake and the Cascade Canyon region. This delicately mastered Giclee print on canvas provides the viewer with an experience similar to that of being there at that special moment in time. Giclee prints of 'Teton Highcountry' are now available. I will add them to this page shortly. Please contract me to order or info. Within Grand Teton National Park and among its wonderous sights there is a special place where the Snake River rests momentarily to reflect a quiet evening light creating a warm serenity found only in special moments. This wonderful Giclee on canvas allows the viewer that experience and provides a moment of peaceful pleasure. The original painting was created in the Artist's studio using onsite pleinaire and photographic references. It was displayed in 2007 at the NOAPS Best of America Exhibition. * Domestic shipping only. International orders will incur shipping charges. - If you do not wish to use the Paypal payment method, please call me at 801 756-6881 for alternate payment methods. - Canvas prints are stretched using wooden stretcher bars and will be recieved ready for framing. If you do not want the print stretched, let me know in the Comments section at checkout. Canvas prints should be framed without glass or matting. Giclee prints on fine paper should be framed under glass. - Your print will be shipped as soon as possible within 2-3 weeks to allow for printing, inspection and approval of the print by the artist, and packing and processing. - I will accept returns within 30 days for full refund less 5% under the following conditions: (1) the print is received by me in original condition and (2) that I have received email notification from you prior to the return.